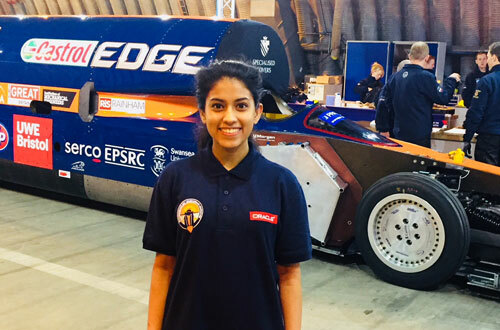 From supersonic cars to artificial intelligence, Lahini Sivaganeshan, (BSc Computer Science), reflects on the first six months of her third year placement at one of the largest digital businesses in the world. Lahini has spent the third year of her degree with Oracle, a global cloud computing service, as a technology consultant, where she is responsible for identifying customer demands, and aligning them to Oracle’s developing technology. “A major project that I have been a part of is Bloodhound SSC. This is a supersonic car that is designed not only to go faster than the speed of sound, but over 1,000mph, which is currently the land speed record. It will cover a mile in just 3.4 seconds. “I was able to visit the Bloodhound technical centre on numerous occasions, and learn the technical and engineering aspects of the car from the engineers and colleagues. I even had the chance to see the car in action on its first test run at Newquay airport! “Being a Bloodhound ambassador also means I visit pupils in schools and present the Bloodhound story, demonstrating the science behind the car and conducting engaging activities with pupils, such as building a Bloodhound car using K’nex. ‘It’s been fantastic to witness the range of experience that Lahini has gained from her placement at Oracle, not only from working on exciting projects such as Bloodhound but also the skills that she has developed from her placement so far.